The Cambodian National Games was held in their capital city in Phnom Penh which was a four-day long competition in boxing. Cambodia’s most experienced international level boxers such as San Tola and Nat Sieknin were able to defend their titles in the Cambodian National Games after the 2016 edition. The first edition of the Cambodian National Games was held in 2016 and boxing was involved to the official program. In the second edition of the Games eight men weight classes were approved to the schedule from the light flyweight (49kg) up to the light heavyweight (81kg) in Phnom Penh. Altogether 71 male boxers attended in the Cambodian National Games in these eight categories. The most popular weight class in the Cambodian National Games was the bantamweight (56kg) where 12 boxers are attended in the competition. Cambodia was not able to attend in the boxing tournament of the Asian Games which was the decision of their National Olympic Committee. The Cambodian boxers competed in the Thailand Open International Boxing Tournament in Bangkok this July which was their last international appearance. The Cambodian boxers have got a long term goal the 2023 Southeast Asian Games which will be held in their capital city in Phnom Penh. Phnom Penh’s National Championships silver medallist and National Games runner-up Sokhon Rigavutha was seriously motivated in the event following his two losing finals. The young boxer won his third final against Kampot’s Duong Sao and celebrated his gold medal at the light flyweight (49kg). Ministry of National Defence’s San Tola attended in the last two editions of the Southeast Asian Games in Singapore and in Kuala Lumpur and those experiences paid off in the National Games. Tola had to do his very best in the final of the flyweight (52kg) against Phnom Penh’s Southeast Asian Games quarter-finalist Hang Ramorn which bout was the best in the whole National Games. Cambodia has got strong traditions in the bantamweight (56kg) but two new faces advanced to the finals this time such as Ministry of Interior’s Mang Sameth and Ministry of National Defence’s Vanna Lyheang. The gold medal was bagged by Mang Sameth who reached his career highlight with this national title. 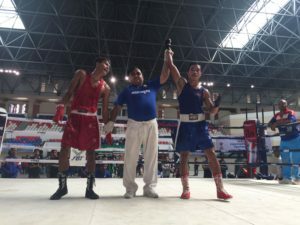 Kandal’s Southeast Asian Games bronze medallist Nat Sieknin is Cambodia’s most experienced boxer who eliminated Phnom Penh’s National Games silver medallist Sem Viseth in the semi-final and continued his winning path against Ministry of Interior’s Soun Channy in the final of the lightweight (60kg). Ministry of National Defence’s Eh V.K. Pouthong claimed the next title in the Games after beating Phnom Penh’s young National Champion Vy Sophors in the final of the light welterweight (64kg). Ministry of Interior’s Ny Sophy defeated all of his four rivals in the Cambodian National Games including Battambang’s Yous Youch and Phnom Penh’s National Champion Vy Savuth at the welterweight (69kg). Ministry of Interior’s Leng Ly arrived to the venue of the Cambodian National Games as the National Champion of the middleweight (75kg) therefore his confident style was enough to beat Ministry of National Defence’s Khon Sokhan. Ministry of Interior’s Phon Phanna is the reigning National Champion at the light heavyweight (81kg) and he also bagged his next title following his success over Kandal’s Srun Pisey.